Since its origin, as symbolic lights off event in Sydney in 2007, World Wildlife Fund’s Earth Hour has grown into the world’s largest movement for public awareness and action on climate change in more than 7,000 cities across the world. 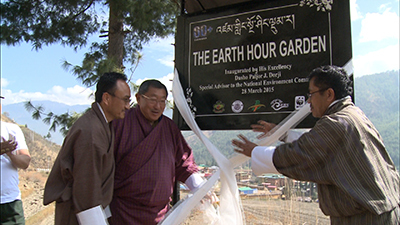 The Special Advisor to the National Environment Commission, Dasho Paljor J. Dorji inaugurated the Earth Hour Garden below Zhilukha Highway. A tree plantation in the Earth Hour Garden was also organized to create the importance of green initiatives that will contribute to fight climate change. Dasho Paljor said there is a need to conserve the rich biodiversity of the country in line with developments taking place. However, Dasho said one day the environment and biodiversity of Bhutan could be worth much more than all these hydropower stations and tourisms and everything can bring. Earth Hour is a World Wildlife Fund’s global event where hundreds of millions of people switch off their lights for one hour in a symbolic display to show their commitment to the planet. The theme for Earth Hour 2015 is ‘Change Climate Change’, spreading the message that individual efforts can bring change in fighting Climate Change globally. The 60 plus symbolizes the need to go beyond the 60 minutes of committing oneself to fight climate change. World Wildlife Fund Bhutan in collaboration with the Green Bhutan Project, Department of Forest and Park Services and Thimphu Thromde organized the event.